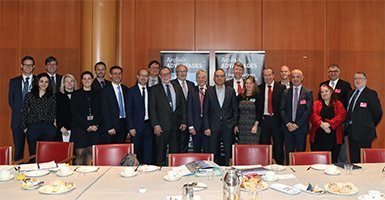 On 17th November 2016, the European Asphalt Pavement Association (EAPA), the European Aggregates Association (UEPG) and Eurobitume had a parliamentary debate in the European Parliament in Brussels hosted by the Member of European Parliament (MEP) Wim van de Camp (EPP, The Netherlands). For 90 minutes 23 participants, among them MEP Ismail Ertug (S&D, Germany), Vincent Basuyau of the European Commission, DG GROWTH, members of EAPA, representatives of UEPG, Eurobitume, the Forum of European National Highway Research Laboratories (FEHRL), and the European Union Road Federation (ERF) discussed the “Environmental Responsibility and Innovations in the European Asphalt Pavement Industry”. 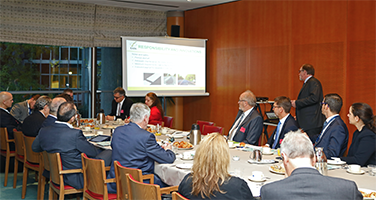 The goal of the debate was to inform Parliament and Commission about role that asphalt pavements play in contributing to a circular economy, a sustainable development and CO2 emissions reduction in the transport sector. Furthermore, the exchange of several important industry related topics like investments in road maintenance and the European road network, Green Public Procurement, road safety and noise, and the European Fund for Strategic Investments (EFSI) were on the agenda. 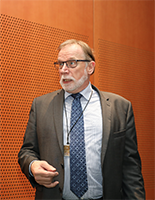 MEP Wim van de Camp welcomed the participants of the parliamentary debate and asked them to tell all their expectations and wishes for the next 2,5 years of legislative period of the MEPs in the European Parliament. After this welcome, EAPA Secretary General Egbert Beuving gave a short presentation to introduce the above-mentioned topics of the debate and to provide the latest figures and innovations of the asphalt industry (www.eapa.org). He spoke e.g., about the top position of asphalt in the re-use and recycling of construction materials related to a circular economy, a recently released Position Paper on CO2 emissions reduction with well-maintained roads and the need for good contracts to implement the already existing innovations of the industry. This presentation was followed by a statement of UEPG Vice-President Thilo Juchem, who gave some background on sustainability in the aggregates industry and their environmental responsibility. Mr. Juchem highlighted e.g. that only 3-5 kg CO2 emissions are produced per tonne of aggregates and that the Green Public Procurement is a good tool to show the environmental benefits of green construction materials. During the debate, when it came to the investments in roads and lack of funding for road maintenance, MEP Ismail Ertug mentioned that the European Fund for Strategic Investment (EFSI) is an interesting tool for investing in roads. Some road construction projects have already been realised with this tool and the European Investment Bank (EIB). 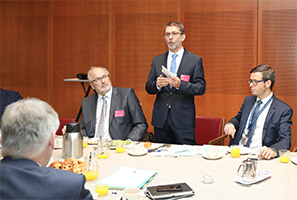 It was proposed that the road construction industry should bring investments in road maintenance to the attention of the EIB or EFSI to see what they can do. The MEPs mentioned that EU focus is on the TEN-T network, but it was stated by the participants that there is an asset value of about 8 Trillion Euro all over Europe of existing pavements which need to be in a good condition for the social and economic welfare of Europe. When it came to road safety the idea of a European Road Agency was discussed. This agency could set regulatory limits for road surface characteristics for Europe’s roads related to safety, noise and fuel consumption respectively for the high topic in Brussels the CO2 emissions reduction in transport sector. In this perspective EAPA presented the industry Position Paper “Safe 28 Mio tonnes of CO2” that links special road surface characteristics like “low rolling resistance asphalt pavements” and well-maintained roads to CO2emissions reduction (https://www.eapa.org/publications.php?c=229). Furthermore, the advantages of asphalt e.g. 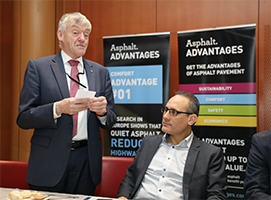 noise reducing asphalt pavements were explained by an example of the “AsphaltAdvantages” campaign that was displayed on a banner in the meeting room (www.asphaltadvantages.com). Another important issue discussed was the disadvantages of the existing procurement systems in Europe and why it is difficult to implement the Green Public Procurement System of the European Commission. 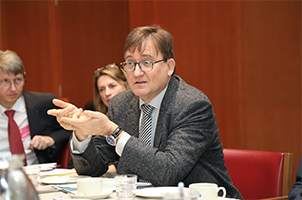 Vincent Basuyau of the European Commission reminded the participants that this is an excellent but voluntary tool for the member states and unfortunately no Member State has applied this tool so far, even if the Commission would like to see that it is implemented more and more in the procurement procedures. 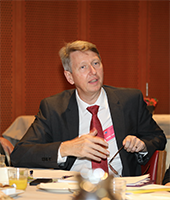 Some EAPA members asked the MEPs to be much more clear and active in providing better regulatory tools for implementing innovations in the field of recycling and re-use of construction and demolition waste e.g., with an improved Waste Framework Directive as an important part of the realisation of a circular economy. Mike Southern of Eurobitume gave a summary of the debate. He highlighted that good infrastructure is necessary for economic prosperity and that EU policy is currently directed towards completion of the Trans-European Network, which is fine, although the existing infrastructure in EU is decaying due to lack of maintenance. This will be even more significant in the future when traffic volumes, in particular freight, are predicted to increase significantly over the next 30 years. Road infrastructure and especially asphalt pavements can (and should) contribute to reduction in CO2 emissions with special existing surface characteristics. Thus, infrastructure will reduce emissions for every vehicle, not only those complying to the latest emission controls. Poorly maintained roads are unsafe, particularly for motorcycles and cyclists. Smooth, well-maintained pavements reduce rolling resistance and directly lead to lower emissions – for every vehicle. Innovative asphalt surfaces are available which can reduce fuel consumption, with low noise, whilst maintaining important safety characteristics, such as wet-skid resistance. The summary furthermore included further sustainable aspects of asphalt pavements like the 100% re-usability of asphalt pavements, recycling shares already exceeding the targets set by the Commission for reduction of waste to landfill, which makes asphalt pavements probably the most re-used/recycled material in EU. Mr. Southern stated at the end that the current ‘lowest bid’ system and some regulations work against the above-mentioned innovations. Green Public Procurement criteria should be able to consider benefits delivered over the ‘in-use’ phase of the pavement and future re-use of the material. The closing of the debate was up to MEP Wim van de Camp. 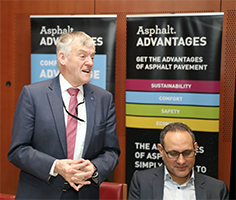 He thanked the participants for their contributions to the discussion and the presented further information about asphalt pavements and its role for the road infrastructure that was given to the MEPs today. 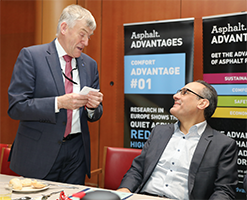 He reminded the asphalt industry to focus more on the tools that are provided by the European Union to increase investment for European roads.